The morning of March 22, to much anticipation, U Htin Kyaw publicly submitted a shortlist of 18 nominees for ministerial portfolios in his new cabinet, giving the world a glimpse into both how NLD intends to run the civilian government and how the military intends to run ministries under its control. Here’s a closer look at this select group of individuals. Headline from the March 23 edition of the New Light of Myanmar. The announcement has come as a shock to some, as the biggest news of the day was that Aung San Suu Kyi would assume 4 presumably full-time ministerial positions, serving concurrently as the Minister for Foreign Affairs, Electric Power and Energy, Education and the President’s Office. It’s raised legitimate concerns as to her management style (especially her ability to delegate responsibility), her lack of confidence in others to carry out these portfolios, and the absence of succession planning. This nomination makes clear that NLD lacks a succession plan, something that should be considered given the advanced age of its leadership team. As for the military, it has chosen to retain incumbent ministers Lieutenant-Generals Sein Win (Minister for Defence) and Kyaw Swe (Minister for Home Affairs) for these two key posts. 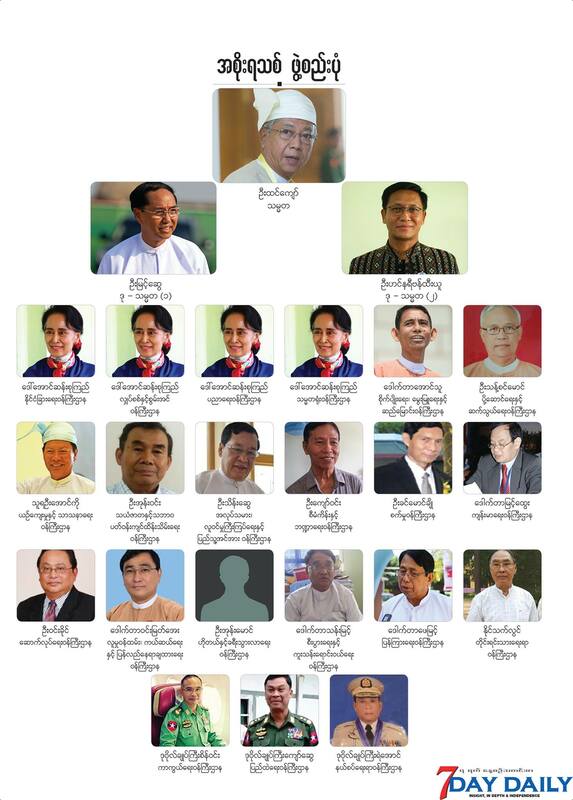 A look at U Htin Kyaw’s inaugural cabinet, courtesy of 7 Day Daily. 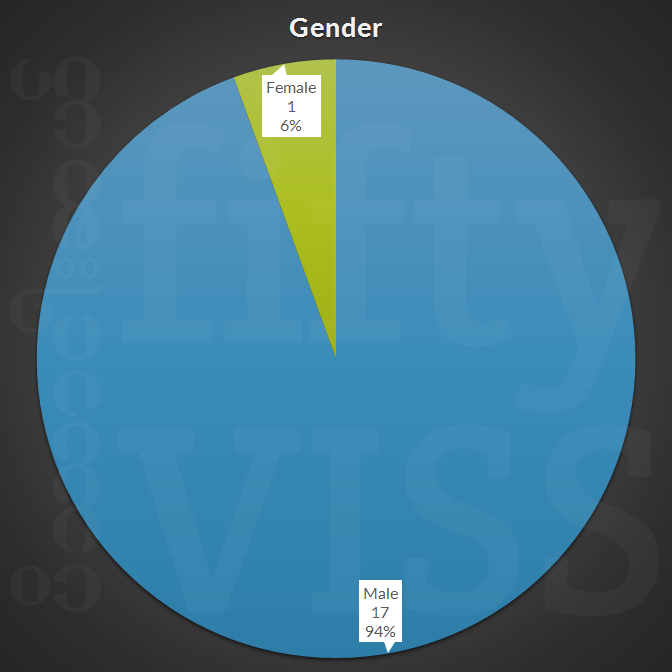 (Please pardon the odd Excel rounding errors in the charts below). The 2008 Constitution requires ministers to be at least 40 years of age. 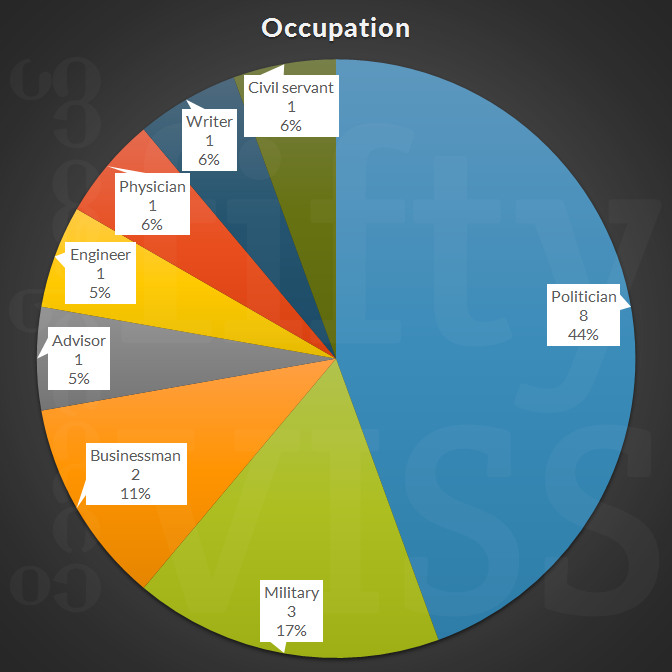 All of the cabinet nominees are well into their 50s or beyond, with the majority in their 60s. The most sprightly of this group, Lieutenant-General Ye Aung, the appointee for Minister for Border Affairs, is 55 years old. In fact, the military’s 3 appointees (for Ministers for Border Affairs, Home Affairs, and Defense) are the youngest of this group. The eldest, Naing Thet Lwin, the nominee for Minister for Ethnic Affairs, is two decades older than Ye Aung, at 75 years old. 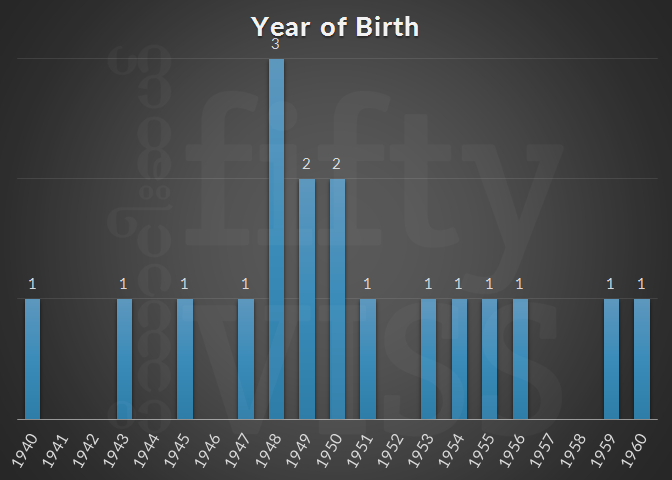 All the nominees were born between 1940 and 1960, meaning that all of them were either born after Burma achieved independence, or spent most of their formative years not under British colonial rule. More notably, most would have spent their childhoods under socialist rule, not the parliamentary period of the 1950s. The 18 nominees come from 9 of Burma’s 14 administrative regions, with the Tenassarim (Taninthayi) Region and Karen (Kayin), Kayah, Chin and Chin States lacking representation. 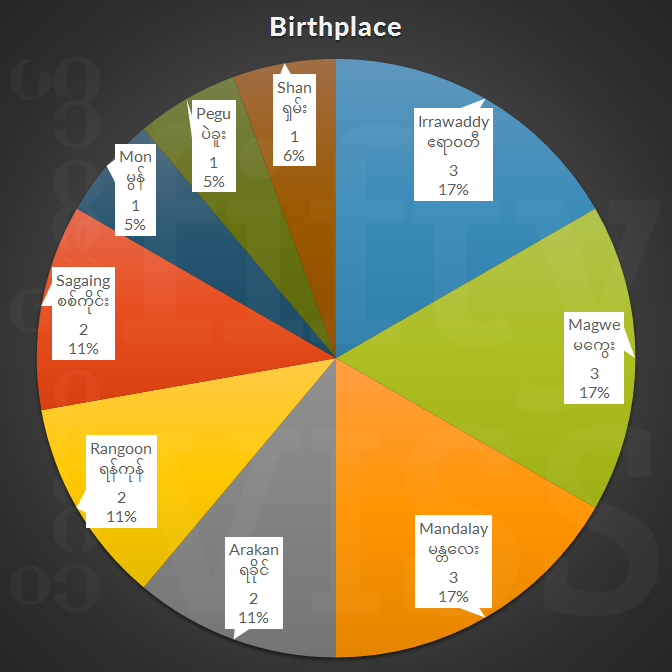 As expected, the plurality (45%) of nominees come from the Burmans’ cultural heartland in upper Burma (Magwe, Mandalay and Sagaing regions), while another third are from lower Burma. One of the nominees, Win Myat Aye, hails from my father’s hometown in Pegu (Bago) region. 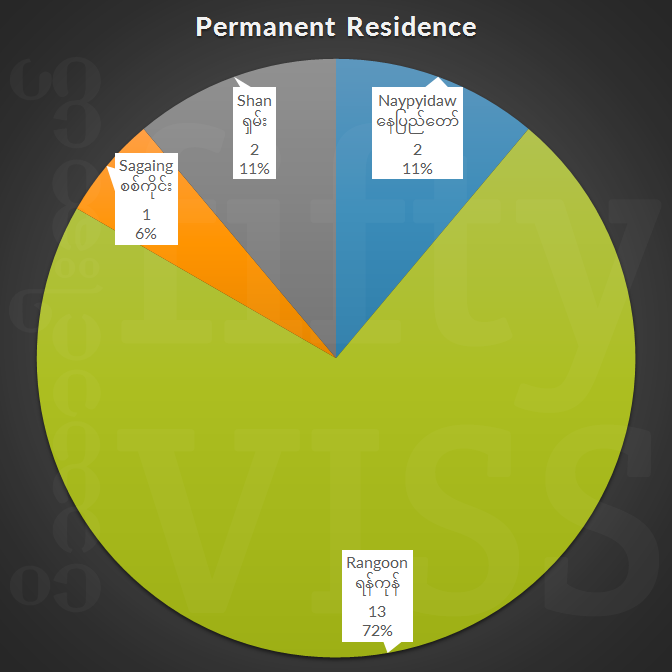 The nominees overwhelmingly reside in Rangoon, with 13 (72%) reporting that they live in the country’s largest city. The two military nominees, Ye Aung and Sein Win, report that they live in Naypyidaw, the national capital. Ohn Maung (nominee for Minister for Hotels and Tourism) and Ohn Win (nominee for Minister for Natural resources and Environment) both live in Shan State, while Thant Zin Maung (nominee for Minister for Transportation and Communication) lives in his hometown of Monywa, in Sagaing region. Incredibly, in spite of assurances by the NLD that women (plural) would be included in the roster of ministerial nominees, Aung San Suu Kyi, who will be representing 4 ministries, is the sole female under consideration. This move has garnered swift criticism from observers, with some accusing the NLD of undermining gender equality and worsening women’s representation in government. 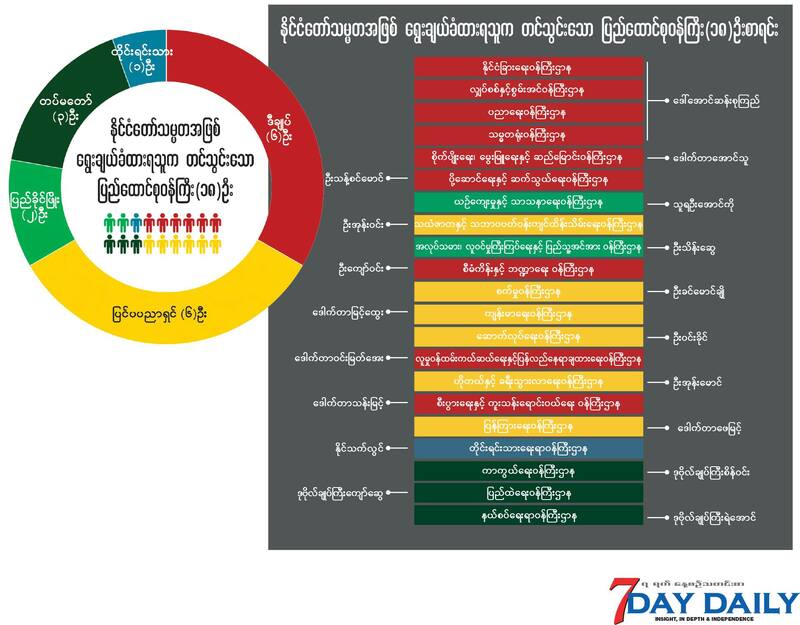 Though it is also important to point out that Burma’s female-to-male ratio has improved in the national legislature, with 13% of elected seats being held by women. 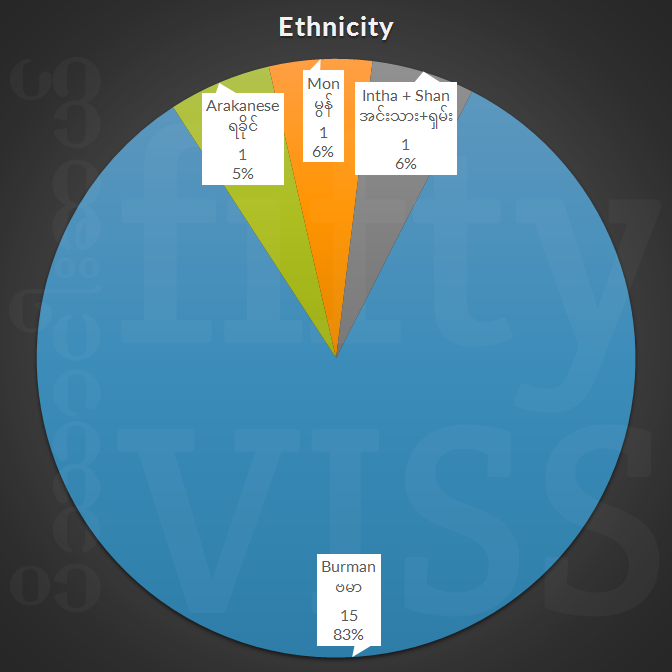 In terms of ethnicity, Burmans will be over-represented in the national cabinet, with 15 of the 18 (83%) ministerial roles going to Burmans. Three nominees, namely Pe Myint (Arakanese), Ohn Maung (Intha and Shan), and Naing Thet Lwin (Mon) are of ethnic minority descent. 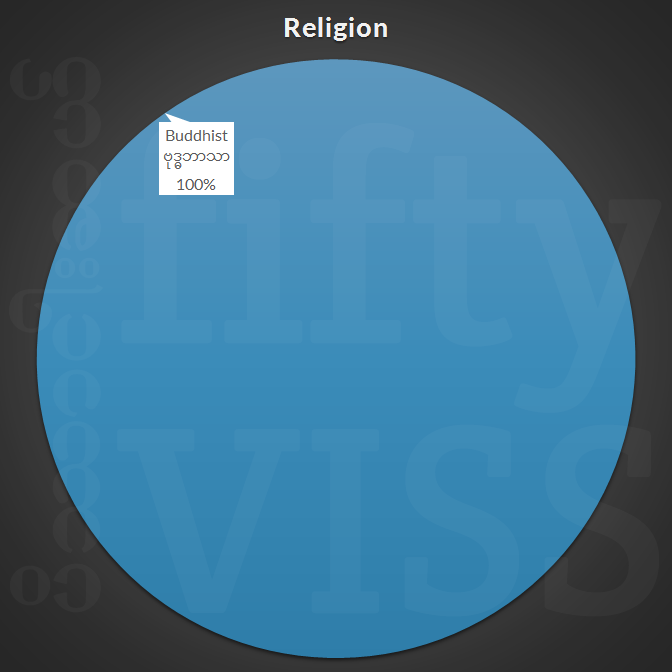 All 18 (100%) of the ministerial nominees are Buddhist. I wonder if this was intentional by design, to temper rabble-rousing from nationalist groups following the nomination of Henry Van Thio, a Christian, to the vice presidency post. Given how opaque NLD has been about its internal decision-making, one can only surmise whether this was a deciding factor in NLD’s initial pool of candidates under consideration. All of the nominees are married. 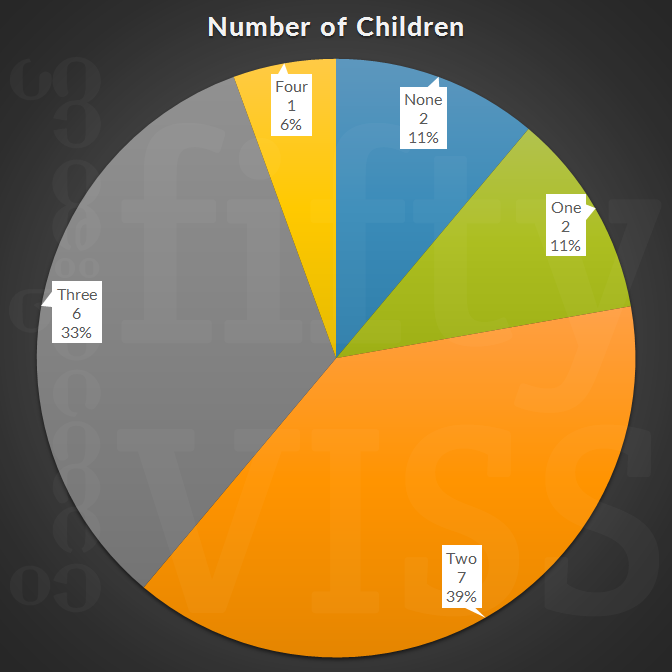 In line with the national fertility rate, most have either two or three children. Two nominees, Khin Maung Cho and Than Myint, have no children, while Naing Thet Lwin leads the pack with four children. Education is a tough one. 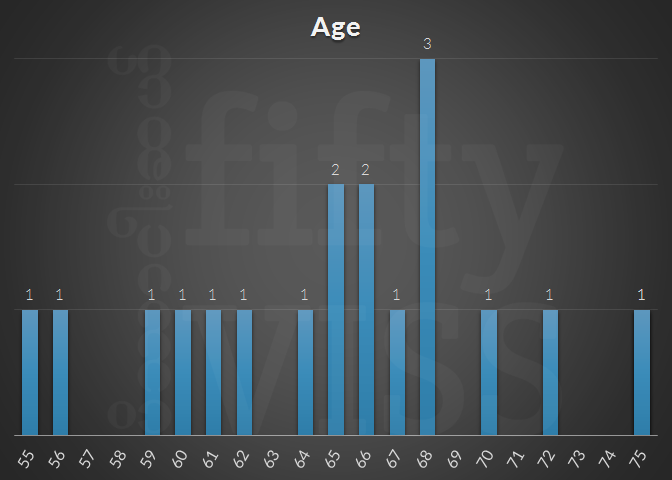 I corrected the data for developments explained below. 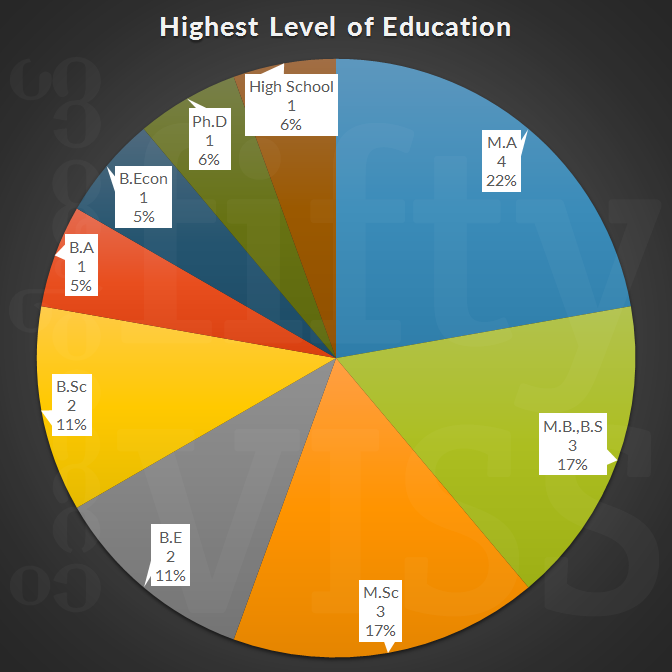 In the educational arena, the nominees span the gamut. The least educated individual, Ohn Maung (nominee for Minister for Hotels and Tourism) completed only his 2nd year of a B.Sc degree in physics. On the other hand, 3 nominees (Myint Htwe, Pe Myint, and Win Myat Aye) are physicians by training, while another 2 (Khin Maung Cho and Win Khaing) are engineers by training. The embarrassing spate of news regarding the educational qualifications of Than Myint (nominee for Minister of Commerce) and Kyaw Win (Minister of Planning and Finance) has highlighted the lack of internal due diligence processes in place to properly vet candidates (all it would have taken is a quick Google search), as well as Burma’s general lack of awareness in this arena (many prominent politicians and businessmen in the country, including Khin Shwe (of Zaykabar Company) and Nay Zin Latt, hold fake diploma credentials. Anyway, both Kyaw Win and Than Myint misrepresented their academic qualifications (a dire offense in most countries), claiming to hold Master’s and Ph.D’s from unaccredited diploma mills, the former from Brooklyn Park University, and the latter from Pacific Western University. However, it’s troubling that instead of recusing themselves from the running, both men have shamelessly allowed themselves to be approved by the legislature. Mind you, they will be leading key ministries concerning the country’s economic development. 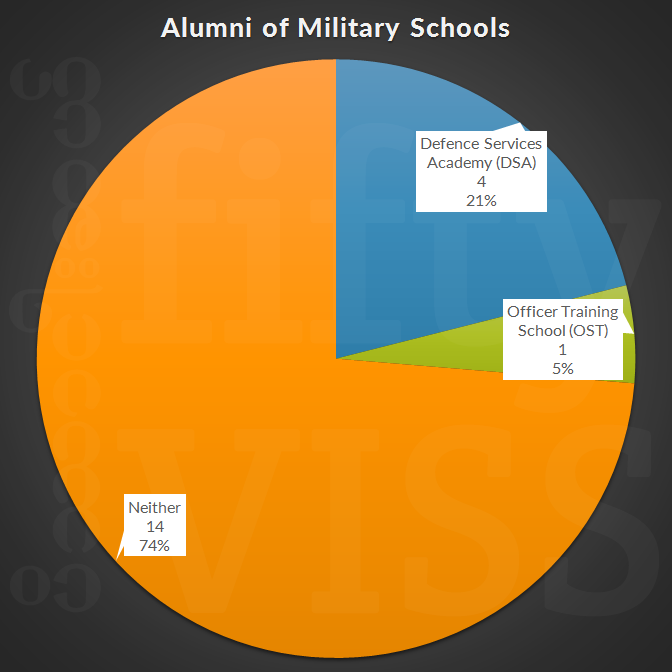 What is interesting to note is that almost quarter of the nominees (21%), including two civilian-nominated candidates, are alumni of the Burma’s elite Defence Services Academy, which has produced many of the same folks that ran the military junta (SLORC and SPDC) and presently occupy the upper echelons of the military’s hierarchy. Both men, Thein Swe (nominee for Minister for Labour, Immigration, and Population) and Aung Ko (nominee for Minister for Religious and Cultural Affairs), are affiliated with the USDP and allies of Shwe Mann. By party affiliation, the nominees are a mixed bag. 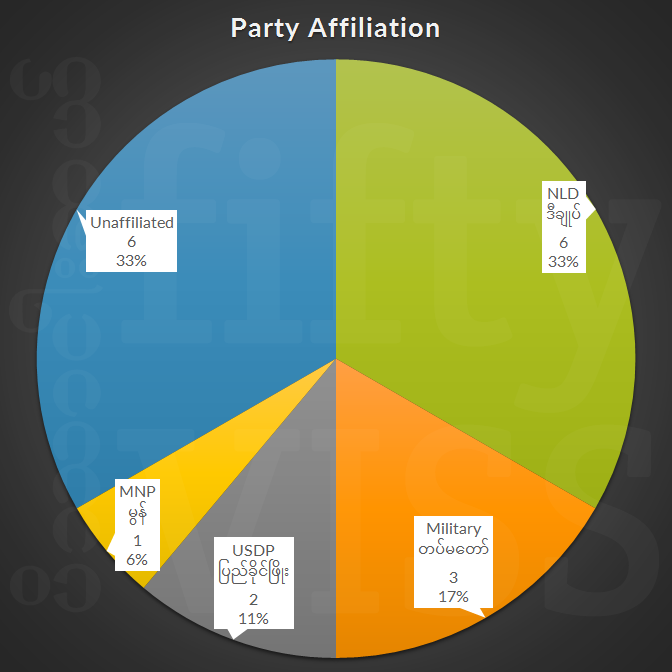 A third are affiliated with NLD, while another third are unaffiliated. Barring the 3 military nominees, the remaining nominees are from USDP, and Thet Naing Lwin of the Mon National Party, who will lead the new Ministry of Ethnic Affairs. In terms of self-reported occupation, the ministerial nominees come from an array of workplace backgrounds. More accurately stated, 5 (Kyaw Swe, Sein Win, Ye Aung, Thein Swe and Aung Ko) have extensive military backgrounds. Of the 8 politicians, 7 are currently sitting in legislature: 2 in the upper house, and 5 in the lower house. The Lady’s apparent inability to remove those nominees with bogus credentials reflects more on her leadership style than the two men’s lack of veracity or shame. It’s a rather inauspicious start that will come back to haunt as soon as something goes wrong, and there’s plenty of scope for that. As for gender inclusiveness in high political office Margaret Thatcher whose legacy to women in Britain was less than impressive at least had one woman in her cabinet. If does not auger well. Agreed. Plus, falsified academic qualifications constitute a serious breach at any organization, not least the government, which is accountable to the public. It’s frustrating to see no serious action has been taken, although this inaction makes sense in light of statements made by NLD spokespersons, who emphasize party loyalty above all else, as a key virtue. Renaud Egreteau makes the point about enhanced representation of minorities. Although a new ministry for ethnic affairs had been created with a Mon at the helm, Daw Suu’s gambit as soon as the NLD government got sworn in was to seek for more powers into her hands on top of the four ministerial portfolios already on her plate. The military was not amused.